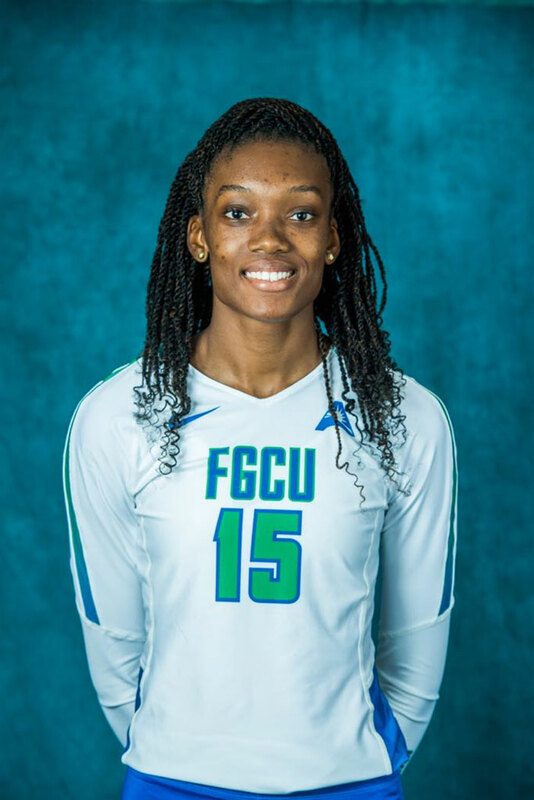 Sea Cows Bay resident Sharonda Pickering is working to help her Florida Gulf Coast University Eagles’ Volleyball team end her collegiate career the same way she started it at the Jr. College level, with a trip to the NCAA Division IVolleyball Tournament. Pickering who joined the Eagles a year ago, helped the Hillsborough Community College Lady Hawks to a bronze medal during the 2015 NCAA Jr. Colleges Association Volleyball Championships in her freshman year of collegiate competition. In an attempt to reverse their fortunes where over the last three years the Eagles have finished second in the Atlantic Sun Conference and looked on as the conference champs got the automatic invitation to the NCAA tournament, they spent part of the summer bonding during a five country, 11-day tour of Europe where they played in six games. After competing in the New Mexico Lobo’s Volleyball Classic over the weekend, the Eagles sport a 4-2 record, ahead of getting into conference play later on. This weekend they will play in the Homewood Suites Fort Meyers/FGCU Classic. The Eagles opened the season with a 25-20, 26-24 and 26-24 victory over Florida Atlantic, improving to 9-6 in season openers. They fell to Central Florida in their next game, 15-25, 25-14, 21-25 and 16-25. Pickering finished with four kills and three blocks. Pickering added another three blocks to her season tally, during the Eagles’ 25-20, 25-18 and 25-22 win over the Miami Hurricanes. During the Lobo Classic kickoff, they were a straight set winner over New Mexico State, 25-20, 25-12 and 25-22. Pickering led the team with nine kills and tied two other teammates with five blocks. The Eagles fell to New Mexico, 23-25, 25-10, 23-25 and 25-18. Pickering, a 6’2” senior, registered another three blocks. The Eagles improved to 4-2, with a straight set 25-20, 25-10 and 25-23 triumph over Eastern Kentucky. Pickering held her three blocks average. The summer trip to Europe Pickering said, has helped the team tremendously, as the team only has a few freshmen, they are learning the style of volleyball and they are able to maintain a higher level of volleyball over last season. With a NCAA Jr. College Volleyball Championships medal on her stat sheet, Pickering said it would mean a lot for the Eagles to advance to the NCAA Tournament as she ends her collegiate career.